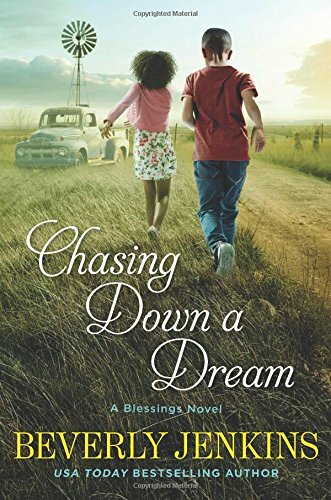 For the eighth time, Beverly Jenkins takes her readers to Henry Adams, Kansas, the historic African American town that Bernadine Brown bought on Ebay in Bring on the Blessings, the first book in the series. The Julys, one of the town’s leading families, once again play a prominent role in the story. Matriarch Tamar wonders if newcomers are giving her due respect, collects speeding tickets to her dismay, and welcomes into her home a dying cousin for whom she has had few kind feelings. Tamar’s son Malachi, dealing with blows to his image of himself in his private life and in the running of the Dog and Cow diner, makes some bad choices and reverts to old patterns. Meanwhile, Malachi’s partner in the diner, Rocky Dancer is preparing for her wedding with eagerness and fear and planning changes for the diner. Other citizens of Henry Adams, some familiar and some new, move in and out of the story, but the central thread involves Gemma Dahl, a grocery store cashier, who is rearing her twelve-year-old grandson, Wyatt, after his mother’s death in Afghanistan. Dahl, a white woman whose teenage pregnancy after an affair with a married man has made her a scarlet woman in the eyes of her hometown--even decades later, has settled in Henry Adams, with Bernadine Brown’s approval, for freedom from the slurs and for the educational benefits the school system offers Wyatt. When Lucas and Jasmine Herman, orphans who land in Henry Adams after a tornado-related accident in which their uncle and new guardian is killed, need sanctuary, Gemma opens her home and her heart. Bernadine and others are supportive of Gemma fostering the two children, who quickly bond with Gemma and come to feel at home in Henry Adams, but the social worker assigned to the case is adamant that Lucas and Jaz not be placed with a white foster parent. Much of the novel focuses on Gemma’s trials and victories and the fate of the two children. The multitude of plot threads that make up this book may be confusing to new readers, but once they realize that the town of Henry Adams rather than a single focal character is the heart of Chasing Down a Dream and all the other books in the series, all will become clear and they will likely fall under the spell Jenkins weaves in this winning series. Fans of the series will delight in catching up with favorite characters. Tamar July is as wise and endearing as ever. Rocky and Jack’s wedding is a highlight, as is Bernadine’s smackdown of one of Jack’s racist relatives. The children are growing, as is the town. This eighth novel may not be the best in the series, but it is an engaging story nonetheless. And every visit to Henry Adams is a joy. It is a place where the evils of real life may intrude but where power is used benevolently, justice triumphs eventually, penitents are forgiven, and love thy neighbor is not a truism but a way of life in all its New Testament amplitude. I never miss a Blessings book. If you enjoy feel-good reads with a large cast of characters and some lovely romance threads, I recommend this book. I love reading her books. I need to get back to reading this series.